Our Fort Lauderdale apartments are located in one of the most beautiful areas of the country. Residents can sun themselves at the area’s many Atlantic Coast beaches or enjoy boating in the city’s elaborate canal system (Fort Lauderdale boasts some 100 marinas). These Fort Lauderdale apartments are also close to shopping, dining and nightlife and scores of family activities. The home of our Fort Lauderdale apartments is part of a large metropolitan area with a population of over 5 million. This includes Boca Raton to the north and Miami, just 23 miles down the coast. Due to its warm, tropical climate and proximity to the ocean, Fort Lauderdale is a popular tourist destination. It is also home to Port Everglades, the nation’s third largest cruise ship embarkation point. Our Fort Lauderdale apartments are conveniently close to hundreds of great restaurants. The Broward Center for the Performing Arts is one of many cultural destinations along Las Olas Blvd. downtown. And the for more adventurous, there is the famous Fort Lauderdale beach and its many clubs and nighttime attractions, just minutes from our Fort Lauderdale apartments. Commuting from our Fort Lauderdale apartments is easy. Two major interstate highways run through the city: I-75 and I-95. There is an active bus and rail system, including the Tri-Rail, which connects all the area metropolitan centers and airports. Fort Lauderdale-Hollywood International Airport provides a convenient alternative to the Miami Airport. Boaters can take advantage of the city’s 165 miles of waterways. Comfortable living awaits new residents of our Fort Lauderdale apartments. Our spacious Fort Lauderdale apartment rentals include air conditioning, ceiling fans and plenty of windows and closet space. Building amenities range from pools and saunas to business centers and fitness rooms. 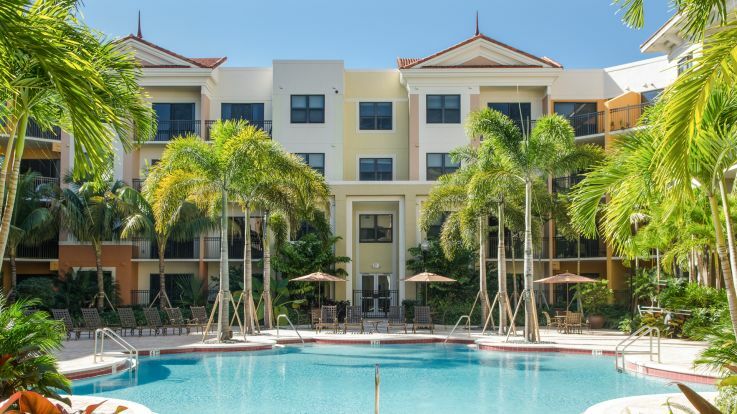 Learn more about all of our Ft. Lauderdale apartments. Equity has apartment communities in locations all over the Ft. Lauderdale area. We're committed to finding you a home that suits your needs. Whether you are looking for a micro-unit studio or a large 3 bedroom penthouse, we can help you find your perfect home. Take a look at the map above to see what we have to offer or browse through all of our Ft. Lauderdale apartment communities.